The use of CHPU with gas engines has undergone a global boom in recent decades in the field of renewable energies. Thanks to technological progress, these plants have become increasingly energy-efficient and thus also more cost-efficient. Today, electrical efficiencies of more than 48% are the state of the art for megawatt plants. The development of engine technologies and lubricants as a fluid design element go hand in hand. In some cases, progress in engine technology was only possible in the first place due to the increased performance of gas engine oils. Following notable successes with ADDINOL MG-40 Extra Plus in the field of contaminated special gases in past years, our research and development department has now scored another coup. ADDINOL Eco Gas 4000 XD is the latest gas engine oil in this successful product range and is specifically customised to the latest engine generation for the use of natural gas and purified special gases. A necessary step forward, according to product manager Sven Köhler, if we want to guarantee reliable and stable operation with our product range even for the most recent of gas engines. 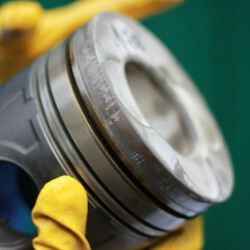 To continue to achieve improved performance data while meeting simultaneously stricter emission standards, manufacturers are turning to new piston designs or changed geometries in the combustion chamber, which bring conventional gas engine oils to their performance limits. ADDINOL Eco Gas 4000 XD relies on a new additive technology to meet these requirements. It achieves greater thermal-oxidative stability and thus delays oxidation and the consequences of oil ageing. Even with purified special gases, the entry of acidic components cannot be completely ruled out. In this case, ADDINOL Eco Gas 4000 XD’s stable alkaline reserve effectively neutralises the acidic components and minimises the risk of corrosive wear. Thanks to high-quality base oils, evaporation losses are also significantly reduced for ADDINOL Eco Gas 4000 XD, and the balanced additive package effectively reduces deposits on valves, pistons, piston rings and liners. This, in turn, minimises spontaneous downtimes and failures and contributes to the efficiency of the system. Thanks to the high engine cleanliness, an extended engine life and thus an extended life of the entire system is guaranteed. Despite more difficult operating conditions, ADDINOL Eco Gas 4000 XD guarantees a stable lubricant film and, in comparison to conventional gas engine oils, a longer oil change interval. In countless field tests by internationally recognised engine manufacturers such as MAN, MWM, MTU Onsite Energy, Caterpillar or Tedom, ADDINOL Eco Gas 4000 XD achieved outstanding results. The oil has long been setting new standards in countless applications. Thus, by switching to ADDINOL Eco Gas 4000 XD, it was possible to significantly extend the oil change intervals of a natural gas-operated MAN engine, with just a 25 litre oil capacity, which is responsible for the energy supply in a welfare facility in Germany. ADDINOL Eco Gas 4000 XD has also already proved its worth when operated with purified special gases. For example, a German agricultural association was able to visibly increase the oil change interval of its MWM TCG 2016 C V12 engine (100 litre oil volume) by switching to ADDINOL Eco Gas 4000 XD. In addition, operating reliability for the engine and thus the entire system was also increased. 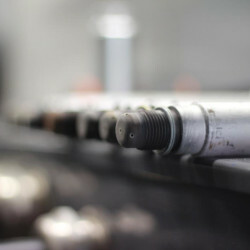 Thanks to the expert evaluation of the oil analyses by the engineers from ADDINOL applications engineering, the oil change intervals have been significantly extended while adhering to the threshold stipulated by manufacturers. With ADDINOL Eco Gas 4000 XD, we reliably meet the requirements of modern engines with high efficiencies, according to product manager Sven Köhler. In addition, the constant support by our ADDINOL analysis service helps businesses to achieve maximum reliability while complying with the warranty conditions of the OEM and machine failure insurance policies. Maintenance intervals can often be significantly optimised when using ADDINOL Eco Gas 4000 XD. This also means significant cost savings for the operator alongside reliable operation of their plant.